Turn to this multipurpose reference for a practical understanding of electronics in the factory or laboratory. It's perfect for people who are not electrical engineers but who need to use electronic equipment every day at work. Avoid or solve common problems in the use of electronics in the factory or lab and optimize the use of measurement and control equipment with this helpful resource! The guide is easy to understand by anyone who has taken a high school physics courseùyet it provides quick, specific solutions for such electronics issues as feedback oscillation, ground loops, impedance mismatch, noise pickup, and optimization of PID controllers. 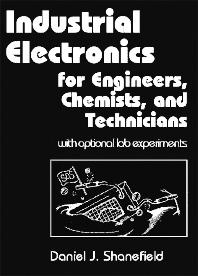 Use Industrial Electronics as a hands-on resource to handle typical electronics questions as they arise, as a self-study text to provide a broad background for understanding general electronics issues and design, or even for an instructor-led, on-the-job training course in shop or lab electronics. Because of the highly detailed explanations in the book, instructors themselves do not need to be experts. Of course, the volume is perfect for use as a textbook in college and vocational school courses. The laboratory experiments are optional and may be used merely as examples. Components are inexpensive and can be obtained from consumer electronics stores such as Radio Shack or from electronics suppliers on the Web. The circuit diagrams are greatly simplified and completely understandable, with every component explained. Chemical and mechanical engineers, scientists, and technicians who are not formally trained in the subject, but need to troubleshoot common problems with electronic equipment and understand various electronic devices.